Sonos, purveyors of multi-room music systems, recently made some interesting announcements. Along with the unveiling of a free controller app for the Android platform the company also released an update that allows those with Sonos components to incorporate Apple’s AirPlay streaming technology into their systems. 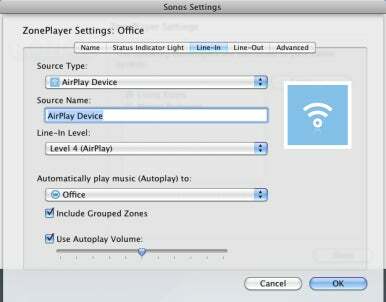 I’ve had the chance to try AirPlay with my Sonos gear and it works this way. Before you Sonos users gavotte with glee, note that Sonos has not incorporated the hardware necessary for their devices to play AirPlay streams natively. Rather, its AirPlay implementation is a workaround for current AirPlay limitations. In order to bring an AirPlay stream to your Sonos system you must first acquire an AirPort Express Base Station. The base station will act as bridge between your home network and Sonos’ mesh network and deliver the AirPlay stream to your Sonos gear. Plug that base station into a power outlet, string an audio cable from the base station’s audio output port to an audio input on a Sonos unit. Then connect the two with an ethernet cable. Fire up AirPort Utility, choose the AirPort Express Base Station, name it Sonos, and walk through the configuration process. During that process you’ll enable both the I Want AirPort Express To Join My Current Network and I Want To Disable The Wireless Network On This AirPort Express And Connect It To My Computer Or Network Using Ethernet options. Using any Sonos controller select the unit attached to the base station, choose its Line In setting, and select AirPlay Device for the source name (using the Sonos Desktop Controller software on your Mac you can choose AirPlay Device from a Source Type pop-up menu). You can also select a particular device or group to play AirPlay content. And you can adjust the autoplay volume—helpful when you don’t want AirPlay volume to be radically different than the volume from other sources. Now when you choose an AirPlay-compatible app, you’ll find your just-added Sonos unit among the destinations. Select it and whatever you’re playing over AirPlay will be channeled to the Sonos units of your choosing. This solution is built with iOS devices in mind. Although AirPlay is also available from your Mac via iTunes, there’s very little reason to use this setup with content from your computer—Sonos lets you stream your iTunes library directly so why go through this rigmarole? And that’s just as well because if you attempt to use AirPlay within iTunes to stream to the base station attached to your Sonos unit as well as other destinations (another AirPort Express or an Apple TV, for example) you’ll find that the music plays out of sync between the destinations. Also, this is a solution for audio files. 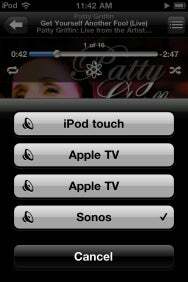 Although you can send the soundtrack of a movie or TV show from your iPhone, iPod touch, or iPad to the Sonos base station, the video and audio will play out of sync. Those familiar with Sonos systems may consider that this solution can act as a replacement for the company’s $119 Wireless Dock 100 ( ), a product that lets you stream the audio content of iOS devices jacked into the dock. The two solutions differ in a few ways. The first is that the dock is more ideally suited for audio that you intend to play for a long time—an audiobook, an MLB broadcast, or an evening’s-worth of music. Try to do this via AirPlay and your iOS device’s battery will be drained in a few hours. Secondly, the dock with an iPod or iPhone jacked into it becomes just another music source. You can plant the device in the dock, leave it, and then browse and play its contents from any Sonos controller. The AirPlay solution pushes content from the device rather than pull it—you must choose the audio you want to play from your iOS device. So, with the dock, you needn’t keep your music player close at hand. Without it, you have to move to your iOS device to select the audio you want to hear. Finally, the AirPlay solution does you no good whatsoever if you want to move music from an iPod classic or nano through your Sonos system. If you want remote control of these iPods, the dock is the only avenue. Ideal though it would be to have Sonos units with AirPlay-compatible hardware built in, we’ll have to wait until Apple allows such a thing and AirPlay matures to the point where you can send multiple sources to multiple destinations (particularly from iOS devices). Until that time, this is the way to bring AirPlay to your Sonos gear.